If you’ve read The Dive from Clausen’s Pier or Songs Without Words, you are familiar with Ann Packer’s talent for restrained, transparent, beautiful prose. 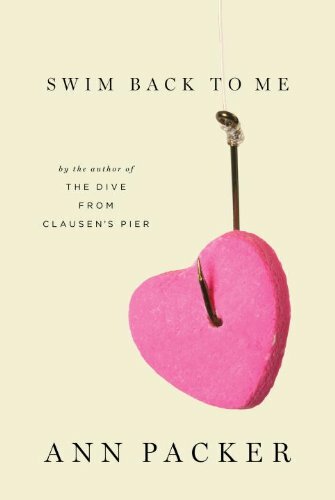 Like her novels, the six character driven stories in Swim Back to Me, underscore Ms. Packer’s quiet way of painting characters without drawing attention with fussy description. She relies instead on precise, small gestures and actions that are sometimes heartbreaking and always insightful and revealing. The opening novella, “Walk for Mankind,” and the final story, “Things Said and Done,” are linked but told from different points of view and time. These two stories bookend the other four unrelated narratives. The common theme threading most of the stories together and creating their emotional core is moving on and living day to day while carrying the weight of memory and loss. “Walk for Mankind” unfolds the friendship of geeky Richard, and the more daring and promiscuous Sasha, adolescents from very different families. The point of view is Richard’s looking back from middle age; the story believably captures 13-year-old Richard’s angst and wonderment regarding the unlikely friendship. He is attracted not only to Sasha, but also to her family, especially her father who he sees as adventurous and engaging. The story’s careful pacing at times felt slow. In “Mouten,” a mother grieves for her dead teenage son, spending her days secretly closeted in his room to listen to his music and touch his belongings when her husband and daughter aren’t home. Packer’s talent for precise detail shines in the raw simplicity of the mother’s gestures. The action she takes at the end of the story is so plainly human and perfectly understandable. It is heartbreaking, and at the same time oddly hopeful. A young husband seems to be holding his breath, watching his pregnant wife Lise’s every move, trying to discern what this pregnancy means to her in “Her Firstborn.” This is his first child, but his wife’s second. Jasper, her firstborn from an earlier marriage, died at five months old. It is not until after the birth of Danny with all his Dannyness that the husband begins to fathom the fullness of his wife’s loss. Packer’s manipulation of language to express this discovery is simple and profound. These are not stories of high drama, yet the quiet details and nuanced points of view make each in its own way poignant—at times so emotionally intense it makes it hard to breathe, and even harder to turn the page.